I took longer than usual to sense the pros and cons of the Lotus Colorkick Curved Liquid Eye Liner. Not that late, when it is time to repurchase this with a surprising verdict. I am mentioning how I prefer using the curved eyeliner and a reason my hopes are dashed. I would not wantonly call this a copy of NYX Cosmetics The Curve Liner, though I wanted it at some point. The curve control kept me consumed all these months, I kept ciphering the ways. But once the control puzzle was resolved, I learnt a wondrous trick. Uses: 20 times or more. The tip is moderately flexible and pointy. 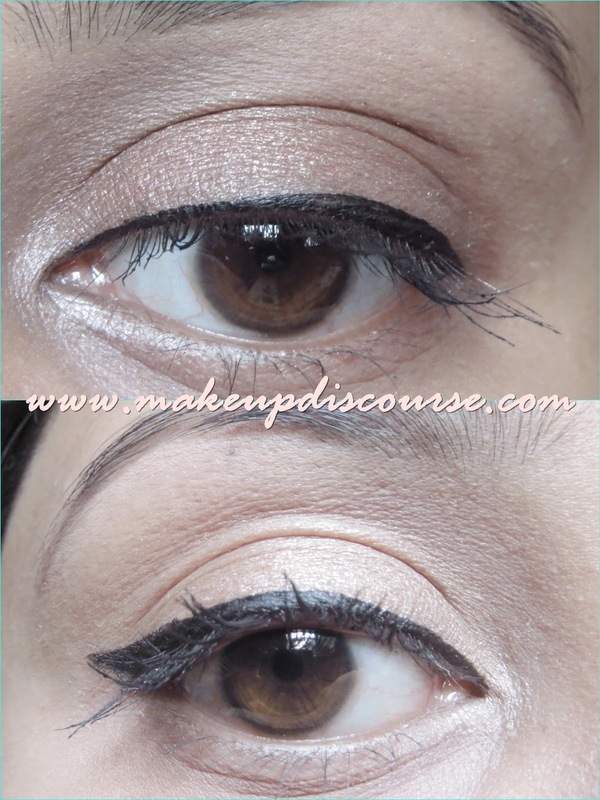 I refrain Tight lining with Gel eyeliner because most of the time, it glides down on my contacts blurring my vision. And I found my perfect tight liner. I tight line: Upwards to inwards. I prefer drawing a thin line close to my lash line. The gaps are filled without any residue to glide down with moisture. I have tried the same method with Maybelline pen eyeliner, but that is effortful since either your fingers or pen intermediates the vision. Feline flicks and Winged eyeliner application becomes plain sailing. I rest this in an angle I want to wing out and then slowly draw inwards. The degree of the angle depends on the drama I fancy. Lotus Colorkick Curved Liquid Eye Liner stays on until you remove it off with a cleanser or makeup remover. It strikingly does stay unaffected through rain, humidity and sweat, unless you rub it off. What displeases me is the quantity and the finish. 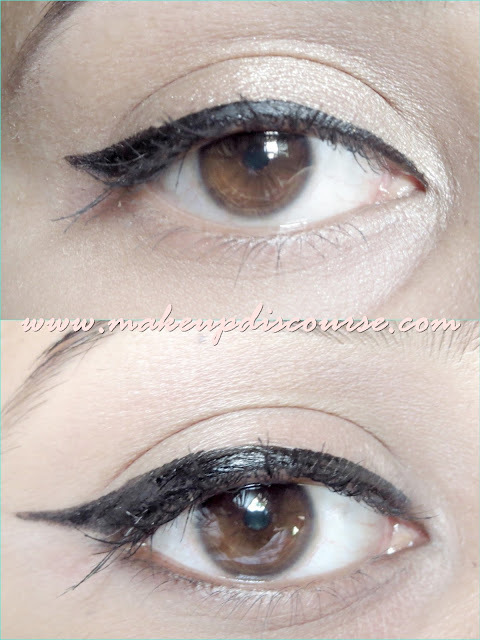 I have loved Maybelline Gel eyeliner and I do not want to repurchase it. I miss the gel eyeliner finish with this. The texture is liquiform and wets the skin surface on application, almost like a liquid eyeliner. It turns out glossier and the glossiness builds with layering. I prefer matte or gel finishes in the morning and daylight. 0.4 ml for 725 INR, Definitely EXPENSIVE! To conclude, I use Lotus Colorkick Curved Liquid Eye Liner for Tight lining; No eyeliner look and when I fancy effortless even winged eyeliner. And to top off my brainwork, I would repurchase this but not before I check out Kryolan Gel Eyeliners. I really loved the way you applied your liner in the first set of pics.. perfect wing I must say. Also I totally feel this one is more on the expensive side.